Sorry for being MIA for a few days. With the holidays, things have been pretty crazy. I hope you all had a very merry one! My cousin got engaged on Christmas (congrats Liz!) when her boyfriend came home from Afghanistan, so it was a great day! Today I wanted to talk a little more about vendors, specifically cake/pastry vendors. Have you ever seen the show Amazing Wedding Cakes? This show puts a surprising exciting twist on baking a wedding cake, or cakes for other occasions. It highlights 4 bakeries in NYC, Chicago, LA and Orange County, CA and these bakeries aren't just bakeries--they're art studios. 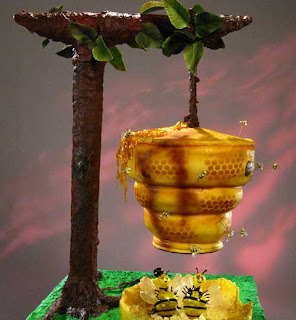 My personal favorite cake that I saw built was a Beehive Cake from the bakery in NYC. This cake actually hung upside down! It looked really neat, but my only question was how were these people going to eat it? If you're looking for a place to get a cake, I would recommend checking out these places. However, I don't have an idea of pricing or ever a wait-list. These places get a lot of exposure, and a lot of customers. I'd look into it early. Even if you don't want to go with one of these places, there are slide shows from each different bakery to see pictures of some pretty extravagant cakes. You can even design your own right on the website for free and print it out! Pretty neat stuff. Cupcakes are now also becoming popular for weddings and other parties instead of cakes. Make enough for each guest to have one, and assemble it as a cake (or in another fashion, if you don't like the cake idea). They're easy to serve, and just the right size of dessert after a full course meal. Maybe serve with a scoop of ice cream and you're good to start the dancing!